Samsung, one of the major smartphone manufacturers in the world has launched a belligerent pitch for new users with an eye scanning, water-resisting, curved screen phone which is likely to arrive in Australia a few weeks before the new iPhone of Apple.The Galaxy Note 7 of Samsung, the new flagship smartphone would be appearing in stores on August 19 though the company has already informed buyers of probable pre-order hits due to a free 256GB memory card offer together with exceptional demand from telcos. The company had also revealed its new flagship phone in New York’s Hammerstein Ballroom recently portraying a big-screen device which seems to be lighter than its precursor but with more storage, water resistance together with security features which comprise of an iris scanners that functions through spectacles and contact lenses. The Note 7 is said to be the first phone of Samsung which would be featuring an eye scanner for the purpose of security besides the phone’s fingerprint scanner. In order to scan the eyes of the user, the smartphone tends to utilise a third camera having an infra-red beam to capture the detecting features in the irises. The scanner seems to function about 30cm away from the face of the user and thereafter the initial scan will ascertain the eyes of the user through clear prescription glasses or contact lenses. 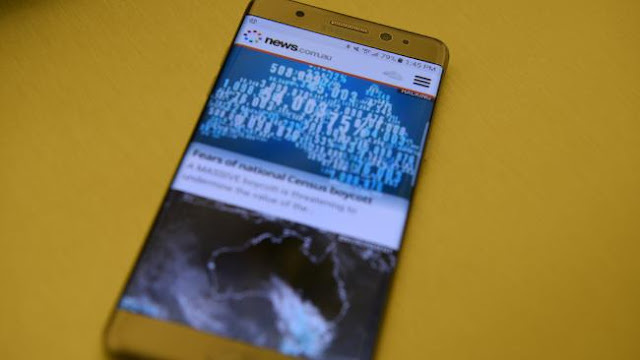 Phil Newton, chief marketing officer of Samsung Australia had stated that the eye-scanning technology was the most secure in safeguarding information in a smartphone and could be utilised also in locking down individual files or app in a Secure Folder feature within the phone. He commented that one does not have to use the iris scanner but it is the easiest way of locking things away. History tells that Note user have intense security requirements. Mr Newton had informed that the Note 7 would also report problem from the last model which had restricted users to only 32GB storage with no space for a memory card. He further added that the big call out for them in the Note 5 was that it has lost the capacity to extend storage which had been the huge issue for Note users and so they brought it back. As a pre-sales offer they will be giving away a 256GB card. He informed that the memory card for $300 would be made available with pre-orders between 5 to 18 August and demand from Australian phone carriers had been `far exceeding supply. Newton also mentioned that based on the present demand the phone, most likely would sell out. Samsung would also be launching a redesigned $159 Gear VR virtual reality headset with the Note 7 and the phone would also be featuring a new USB-C connection. Foad Fadaghi, managing director of Telsyte had stated that Samsung Note 7 launch date would provide the company with a lead of a month on the impending iPhone launch of Apple and was a strategic move to win added attention. He also stated that it is straight from the playbook from Samsung in trying to surpass Apple by proclaiming its handset a month earlier. According to Canaly, sales of Apple iPhone had dropped in the second quarter of the year, to 40 million handsets worldwide. The company claimed top spot with 80 million smartphones sold after the launch in February of the Galaxy S7 and S7 Edge handsets.